Introducing the handy pressure washer that is not only compact and power packed, but can also get rid of stubborn grime and dirt within a matter of minutes. The AR Blue Clean AR116 with its axial radial drive three piston pump offers a perfect solution to the harried homemaker by providing that extra bit of power to get rid of stubborn stains. Manufactured by Annovi Reverberi S.p.A. of Italy, this pressure washer is part of the Triplex Plunger Pumps, which introduced the special Total Stop System – a trigger gun design that controls the washer. In addition, a safety lock mechanism keeps the trigger from engaging while the equipment is not in use. The AR Blue Clean AR116 comes with an in- built convenient accessory holder. Furthermore, the gadget packs a maximum pressure of 1,450 psi (pounds per sq inch), and a 120-volt Universal electric motor that boasts a 11 Amps Annovi Reverberi 3 axial piston pump. Adding to the incredible features of the AR116 are the tempered stainless steel plungers with automatic safety valve and an auto power shut-off at pump head, which is the special Total Stop System facilitating automatic start/stop functions. The AR116 is light-weight and compact with a safety lock built-in to prevent accidental start-up. It also happens to pack a lot of power making it easy removing stubborn grime and permanent stains left by algae and oil. This washer works wonders on shaded concrete and comes with trigger gun control, automatic start/stop with attachable accessories such as soap or foam bottles. Compared to a gas pressure washer, this electric pressure washer is almost noiseless, except for the noise of the water squirting out at high pressure. The AR Blue Clean AR116 produces just 78 decibels of noise, which is hardly anything considering its usability. Nevertheless, it could have been better sheathed to hide some of the noise. The AR Blue Clean AR116 comes with a comprehensive set of accessories that are compactly built into an accessory holder. The pressure hose and Lance adjustable nozzle are snugly tucked into the gadget, and are easy to access whenever required. Moreover, the built-in accessories make it easy to clean difficult and challenging areas such as gutters, drains and roofs. Although this electric pressure washer is light-weight and weighs just 11.8 pounds, it is built sturdily with key parts made of tough stainless steel tempered for added strength. The durable axial radial drive pump is built to last and features three pistons for better performance. Additionally, the 120 volts 11 Amps Universal electric motor is silent, efficient and long lasting. This Blue Clean electric pressure washer comes with clear instructions spelled out in the user manual. Although breakdowns are a rarity, in case of any problem, one can reach out to the customer service team that is available to trouble shoot and help resolve the issues. Light and easy to use, packs immense power required to dislodge stubborn stains and dirt, 20’ high pressure hose helps access difficult areas without much effort. Pressure cannot be adjusted according to the need. The reset button needs to be pressed only after setting up and connecting the equipment, and not before, which can be a bit confusing. 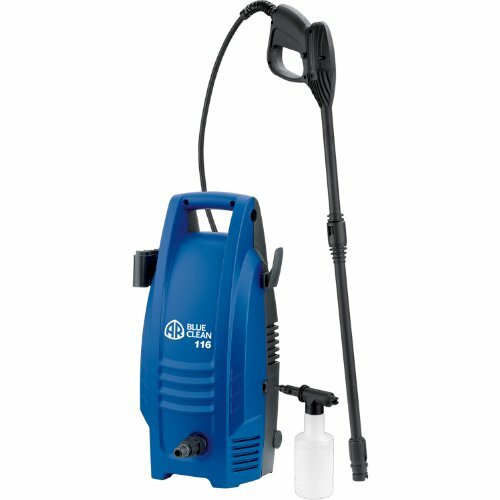 The AR Blue Clean AR116 is a boon to all those who hardly have the time to mow the lawn or help around the house. It is light-weight, portable and can be used to clean any part of the house. While it is perfect for cleaning the backyard and driveway, which are prone to dust, dirt and grime, it is equally fit for the interiors, especially the kitchen area. It is also great for washing off persistent dirt and filth from your car, especially the underside.